The Klipsch R-5502-W II maintains the core technology use of a premium 1” Titanium compression driver (tweeter) mated to an exclusive Tractrix Horn combined with dual 5.25” Cerametallic woofers in a 2-way design. 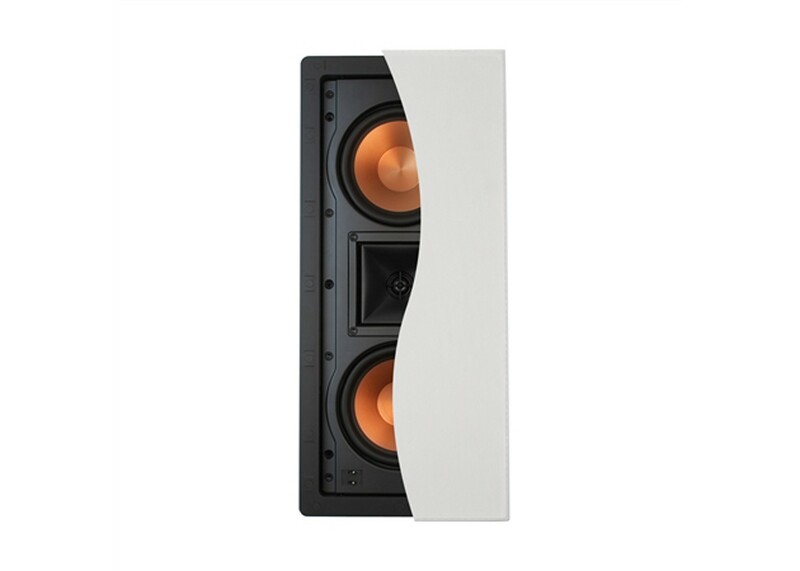 The R-5502-W II is perfect as a very powerful front right, left or center channel speaker and can fill the largest rooms with sound. Now with a new low profile, more elegant grille and refinements to both high frequency and low frequency reproduction, it continues as the perfect choice for everything from 2-channel music playback to full, large room surround sound use. With an all new grille, the visible frame size is reduced by 90% and grille depth is reduced by 80% over the previous design, for a more edge-toedge consistent look that blends in with the wall more attractively. The new aluminum, paintable, magnetic grille attaches tightly and securely with ease to virtually eliminate resonant distortion. Klipsch horn-loaded technology increases acoustic output while significantly reducing distortion. The horn’s 90° x 90° dispersion pattern directs high frequencies identically whether speaker is mounted vertically or horizontally (as a center). Horn pivots +/- 15° to aim sound directly at the main listening area. This feature sends more direct sounds to the listener and less reflected sounds for more detailed sound, wider dynamics and better vocal clarity. Combined with the Tractrix Horn, the one-inch, solid-formed, very lightweight metallic diaphragm works in conjunction with a precise phasing plug at the horn throat to create a highly efficient driver with excellent transient response and lack of distortion. The new Linear Travel Suspension assures the most precise diaphragm excursion, increasing high-frequency detail and smoothness. The dual woofers utilize solid Aluminum diaphragms, anodized to add stiffness and provide perfect damping, and have a new hi-tech look that also delivers increased rigidity for even tighter, more defined bass. The new integrated dust caps further strengthen the cones and help ventilate the voice coils for increased driver durability. The perfect blending between drivers for full bandwidth balanced response. Allows installation of standard, .5” tube-type, IR repeater device. Provide even pressure against drywall for long-term installation reliability. For increased mounting flexibility and pre-install marking during new construction.